This guide is intended to show you how to use the XML editor within CRS Builder. By following this guide you should be able to use CRS Builder to explore the most important parts of the CRS XML Schema. However, it is not a full guide to CRS XML itself. The meaning of the CRS elements is explained in the OECD's CRS User Guide and the Igor XML Reporting Guide. Create a shortcut to https://crsbuilder.digimap.gg/ on your desktop to have CRS Builder available to you when you need it. 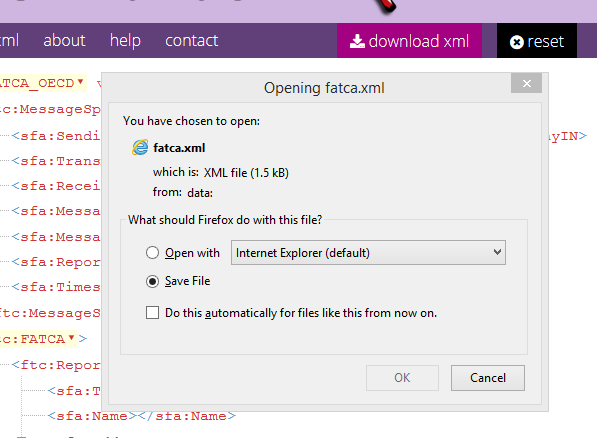 You can also click the home () icon at the top left of this page to return to the XML building screen. If you have downloaded an XML document from CRS Builder to your PC, you can import it back in by dropping it onto the XML editor. CRS Builder will remember your XML while you keep your browser tab open. You can open a second browser tab and work on two XML documents simultaneously. If you want to clear all your changes and start again, click the 'reset' button.